Any date from April 29 through May 10, 2019. The Contests for the 2nd (25 questions), and the 3rd and 4th grades (35 questions) will be multiple choice questions appropriate to that grade level. Each of the other Contests consists of 50 multiple choice questions based on the following topics: spelling, vocabulary, reading comprehension, analogies, and grammar. We believe our approach to these topics will provide a meaningful as well as enjoyable learning experience for your students. Each Contest has a time limit of 35 minutes and may be administered comfortably within one class period. You will download a PDF file of the questions for each Contest you enter. Please duplicate as many copies as you need. Answer keys will be provided. There is no limit to the number of students who may participate. While the Contest contains a few difficult questions requiring creative thought, most of the questions are suitable for the majority of your students. The students are to work independently on the questions. Each test is to be proctored and graded by the school. The top ten individual’s names and their scores are to be entered on our website. The sum of these top ten scores is the school’s team score. All schools can view the results on our website. Each team will receive 11 awards- 1 medal and 10 certificates. Each additional team that your school registers entitles you to receive 1 additional set of awards. There are also individual and team awards on the national level. This is the date you must enter your scores by to have your school listed on the results report. 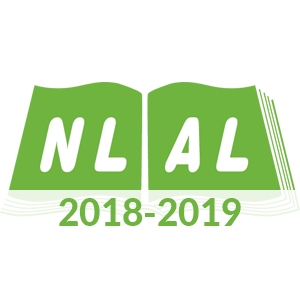 Click on the large NLAL logo above the grade level you want. A page will open where you can download a sample test. We are currently accepting registration for the 2018-2019 Contest year.